Plain roasted cauliflower is something you may never get tired of, but every once in a while you may want to go for a little extra something. Maybe because you’re having company, or just maybe because there’s some extra sauce in the fridge, and plain roasted cauliflower can turn into something special. This sauce is equally good made with broccoli. Serve the sauce on the side, and let people put some on their plates for dipping, or drizzle it over the whole platter if you know your family will like it. Preheat the oven to 450 F with the rack placed in the lower third. Cut the cauliflower into florets, and place in a large rimmed baking sheet. Toss the cauliflower with the 2 tablespoons of olive oil (your hands are really the best tools for this) and about 1/2 teaspoon of salt and a few grinds of pepper, if desired. Roast until slightly browned and tender, turning gently with a spatula once if you remember, about 25 to 30 minutes. 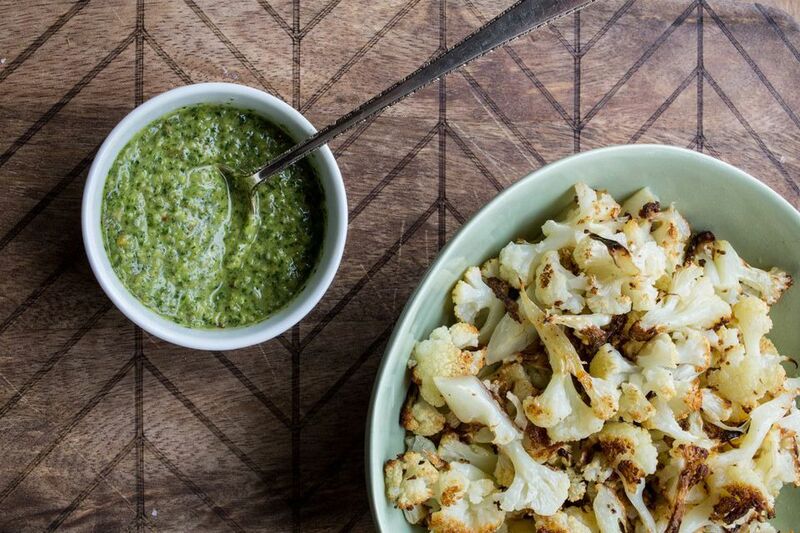 Make the chimichurri sauce while the cauliflower is roasting. In a mini food processor puree the olive oil, parsley, garlic, onions, vinegar, salt and pepper, oregano, and red pepper flakes. Taste and adjust the seasonings. Serve the chimichurri on the side and let whomever is interested drizzle some on their cauliflower.